The Poor Potter is Dead, in Three Parts. – William Gooch, Royal Governor of Virginia in his 1745 status report to the Lords Commissioners for Trade and Plantations regarding Yorktown potter William Rogers. Gooch had regularly dismissed this poor potter to the Commissioners since 1732. Yet during that time Rogers operated a huge earthenware and stoneware manufactory. He made everything from crocks to bird houses. His specialty was Fulham style stoneware mugs, fired in special saggars. Rogers also ran a brewery, was “Surveyor of the Landings, Streets and Cosways in York Town” (allowing him to use his shards to pave streets), and Captain of the Troop. In short, he was one of the wealthiest people of the colony. Royal governors were supposed to enforce laws suppressing colonial production of consumer goods. Such goods were meant to be purchased from factories of metropolitan England. But many governors, like Gooch, supported the locals by issuing bogus reports about “poor potters” and such. 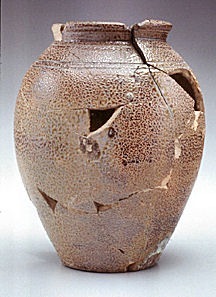 It’s possible Rogers was just a pottery owner, given the extent of his other activities and his wealth. Who ever heard of a rich potter? Still, all existing accounts of him highlight his potting activities. So I prefer to think of him as the country’s first major pottery figure. If he wasn’t, why should Gooch mention him at all? The “Poor Potter” of Yorktown. C. Malcom Watkins and Ivor Noel Hume. United States National Museum Bulletin 249. Smithsonian Institution Press. 1967. You are currently browsing the archives for the William Rogers category.